Stormy skies spawned some stunning sunsets last week. If you missed their beauty, travel to Treasury Island with Rhonda of Paint Brushed Boutique instead. Boldly beautiful gift ideas include antique Celtic knot earrings by Kerala, plum flower hair clip by Ellie Grace Crafts and my purple unicorn magnet. 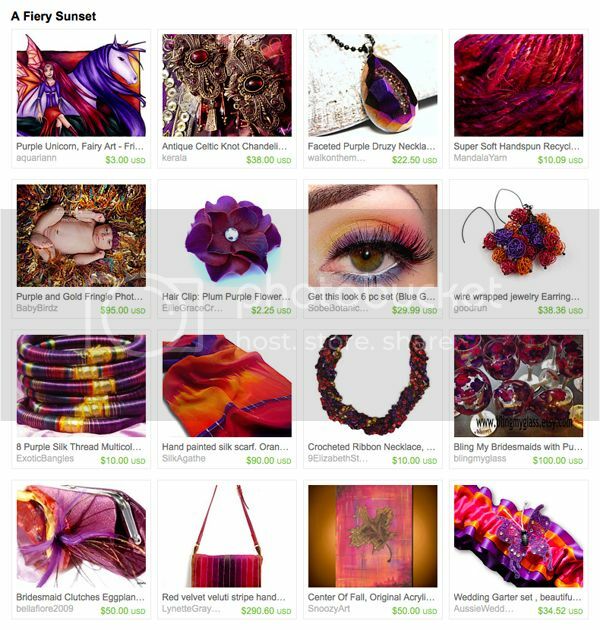 Fabulous treasury's, love them all! I hope I am doing this right. I created my treasury I know who I am. Finally. It took me 52 years to figure it out. I love lace, antiques, fine china, beaded vintage gowns. I love art, creative people and soft blankets. I hope you enjoy my post. Posted my treasury When the selkies rises. I have an obsession with seals and the lore through out history of the selkies. Enjoy. I love the hues of purple and red in "Fiery Sunset" :) your lovely unicorn and his faerie companion fit perfectly! Red and Purple...passion and spirituality!!! Lovely! I just love this color combination! Warm...fiery....gorgeous!